On Sunday I usually go for a more in depth skin care routine! I keep my everyday skin care very simple and easy. You can view my everyday skin care HERE. On Sunday I use an acne cleanser and pore strips. I also use a face mask. I choose to do my in depth skin care on Sunday as it sets my skin up for the week! I have somewhat sensitive skin so using these products all week would be to harsh for my skin. Firstly I wash my face with the Proactive step 1 Cleanser. 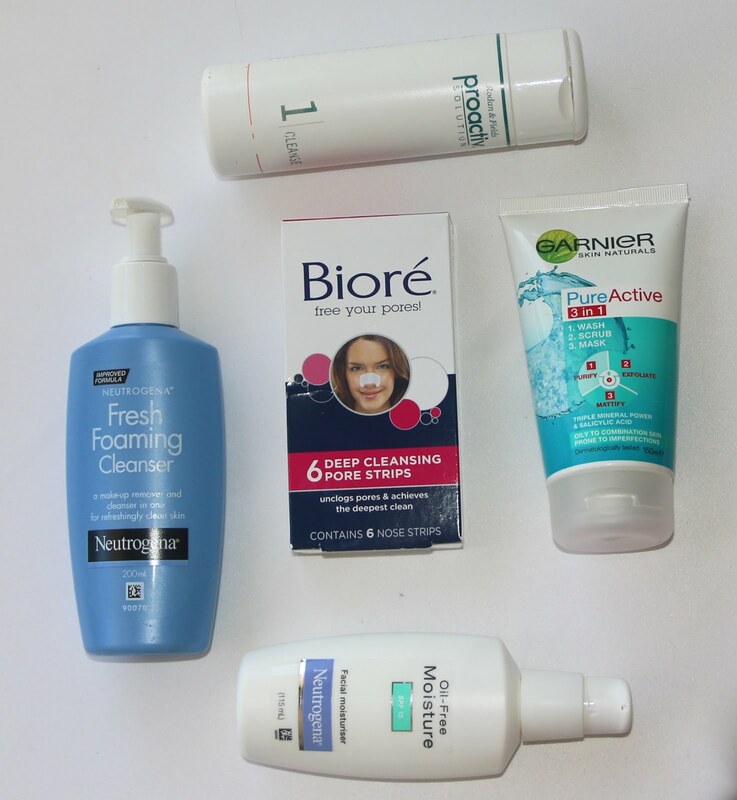 Sometimes I will use my everyday face wash as well if I feel like my skin isn't clean enough! Or everyday face wash alone if my skin is feeling really sensitive. Secondly I go in with a face mask! I use this 3 in 1 Pure Active Wash, Scrub and Mask from Garnier. If I am ever feeling really lazy and can't be bothered waiting for the mask to set I will use this as a face scrub! This product is lovely! It has an amazing smell and makes my face feel very smooth! Then I apply a pore strip to my nose! I only recently got into doing this! I had never tried one before until a few weeks ago and I really like them! They clean all the pores out and leave your nose feeling clean and clear! I use the Biore deep cleansing pore strips. Lastly I apply my moisturizer! I use the same moisturizer that I use on a daily bases, which is the Neutrogena oil free moisturizer. If my skin is really dehydrated I will go in with a rich night cream, I don't do this very often though. Sometimes I like to change up the products I use, the face mask could be different or I may add in a few other things like a scrub or a face oil. Do you do a more in depth routine one night a week?